When my colleague suggested that we include an exercise asking participants to bring homemade food to share in a collective lunch as part of our workshop “Working with Affect, Feelings, and Emotions in Film and Humanities Research”, I balked. “That will never work,” I panicked, “people are too busy doing important things”. Not only did it challenge the ideas I had of what a conference or workshop should be, but it seemed to go against the individualistic and controlling spirit I often find in myself and the university. My dubiousness, while highlighting my personal neurosis, also pointed to the deeper problem of how institutional structures seem to encourage rather than heal this mentality. I have been fortunate to work with a group of interesting, passionate, and giving individuals in my program, yet I cannot help but feel the continual pressure to stand out as an individual. In the end I must compete with my colleagues for a limited amount of funding and jobs where committees plough through stacks of increasingly similar applications looking for that one thing that separates this person from the pack. Apart from an academic drain, this is an emotional drain as well, making it little wonder that emotions and feelings are so casually swept to the side in research as those involved are time and again asked to keep their own emotions in check in order to get the job done. Given this atmosphere, that has only grown more apparent to me as I become deeper embedded in academic realities that obscure my idealistic fantasies, the idea of something so intimate as a communal homemade meal in a university setting made me not only hesitant, but scared. Yet this fear, which I felt was completely rational in a university context, went against everything that the day was supposed to represent. As my co-organizer Isabel Seguí kept reminding me, and so eloquently put it in her introductory remarks to the day, we were organizing this precisely to challenge “the patriarchal and materialistic society and institutions that did not give us the tools to acknowledge the emotions and affect in our research, instead telling us to reject them as subjective and unscientific and, therefore, undesirable” and “question this false ‘rationalism’ that dominates the academy”. Hence any attempt to open up this subject would take us into murky and disconcerting territories, but in order to bring this approach out of the shadows we had to be willing to travel into the shadows ourselves. In the end we agreed that despite our, and mainly my, fears, this activity had to be included in the day. Whether it succeeded or not, it would be a lesson, teaching us about how we prioritize our time, community, and emotions and how we integrate them into our academic life. In an environment in which it seems that nothing is ever completed, the simple pleasure of finishing a task becomes alarmingly elusive. We learn that even turning something in to a supervisor, publisher, etc. is the work just entering another phase of evolution as it presents itself to scrutiny and criticism that will reveal how sorely unfinished it is. The opportunity, then, to share something that has been crafted and completed and would be appreciated as such thus is transformed into an experience of emotional satisfaction. When it came time for the lunch break there was an excited bustle as tupperwares and dishes began to appear out of the bags usually burdened with laptops, library books, and crumpled papers full of half-baked ideas. Suddenly we were no longer in a conference room but in a home. The domineering faces of our academic forefathers swathed in dark robes of authority stoically stared down at us from their portraits as we discussed serious issues and excitedly awaited the pleasure of a meal that had been lovingly prepared and that would be shared amongst not colleagues, but friends. The colours, smells, and diversity became a point of wonder as we all gazed with animated curiosity and anticipation at a feast of pad thai, curries, pathora, tortilla, sushi, pizza, and cakes that the participants had loving prepared and now proudly shared with us. With each dish came a story of the culture, history, and experience that accompanied the food. This one was prepared by somebody’s whole family, that one was a special dessert for holidays, while the cake had been a baking experiment that had thankfully turned out right. 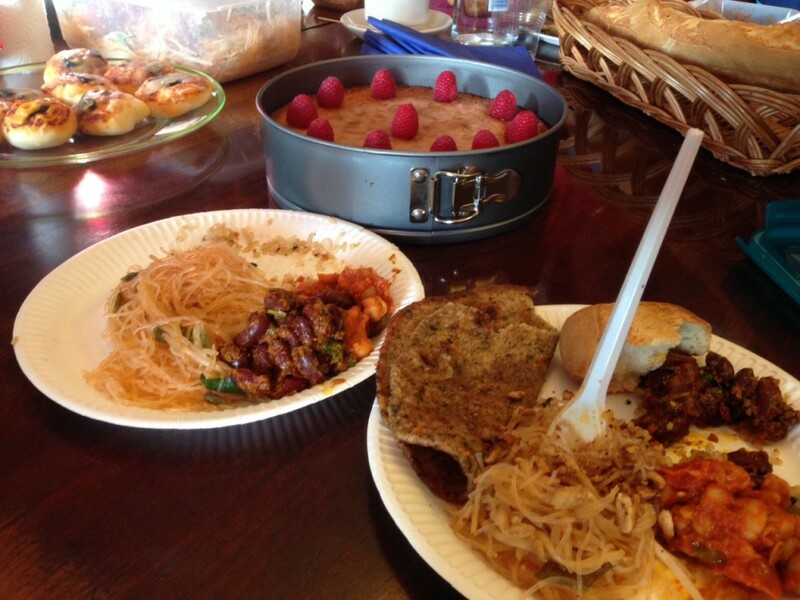 There were also little displays of kindness and emotion; the eggs were put to the side of the pad thai in consideration of one participant’s distaste for them, several dishes were made vegan to meet the dietary restrictions of another. Far from a disaster, the whole experience had turned into exactly what we had envisioned: an emotional engagement between people who had taken the time to share something with another and who were rewarded with the appreciation and communal feeling of friendship given in return. It really could have gone either way. And even if this experiment had failed, if only the organizers had brought food and nobody else participated, I still would have written this reflection piece. In the end the activity was about more than whether or not it functioned in this one setting, but was a reflection on the values of this environment that consumes so much of my life. Is it just a narcissistic vortex of self promotion and backstabbing that, apart from the grim job prospects for young academics, makes me question more and more whether I want to devote my time and energy to being, or at least trying to be, part of this institution? Or is it a place in which there is a community value and in which collegial interactions and personal feelings and emotions can be acknowledged and encouraged? As with most things in life, I find it somewhere in-between. However in this time of great university upheaval and changes of institutional structure, academic freedom, and the university community, it is these small reflections that allow us to question how we keep some of the values from being consumed by a burgeoning bureaucracy. For me, more than the conversations had and debates evoked in this workshop, what was important was that for one day, even one moment, we created a place in which we could allow some feeling to enter, could share something together, and in which our human position was acknowledged and embraced. Amber Shields is a PhD candidate in the Department of Film Studies, University of St Andrews. Her research project is entitled “Inbetween Worlds: A Fantastic Approach to Trauma” and explores fantasy as a mode of cultural trauma representation. Her main areas of interest are trauma, fantasy, cultural memories, collective identities, and storytelling. She holds a BA in Latin American Studies from Carleton College and an MPhil in Screen Media and Cultures from the University of Cambridge. The idea of doing a participative activity with food intrigued us on several grounds. On one hand, we saw it aligning with Charles Wright Mills’ idea of “intellectual craftsmanship” and its emphasis that academic research is also a craft and that we should be loving artisans if we want to reach results that bring something good to us and to our society (See The Sociological Imagination). It is also a practice that has precedence in community organization where sharing food and food preparation duties is a significant aspect of bringing groups together. 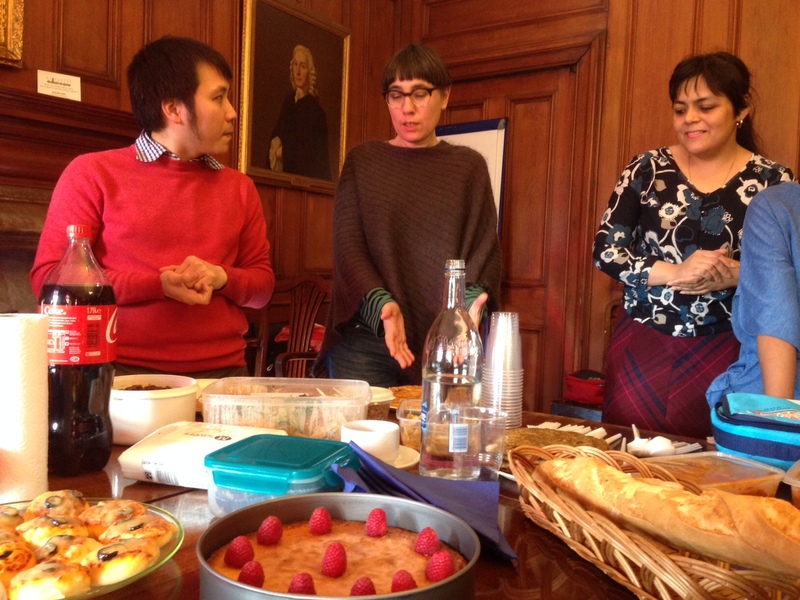 Further for those doing research that involves working with others, food and the sharing of food often becomes an aspect of these research projects. Isabel Seguí, “Introductory Remarks,” Presentation at the University of St Andrews, February 2016. Wright Mills, Charles. The Sociological Imagination. New York: Oxford University Press, 1959.